Ganesa Deepak 3D Printed Husky pillow Yollow Dog Sofa Husky Doge Face Car Cushion (yellow dog) by Ganesa Deepak at Animal Backgrounds. Hurry! Limited time offer. Offer valid only while supplies last. A suitable headrest comforts drivers and passengers, to get rid of fatigue as well. Home, decoration, sofas, car, back of a chair,sleeping pillow. A suitable headrest comforts drivers and passengers, to get rid of fatigue as well. It is convenient to wash the cover. 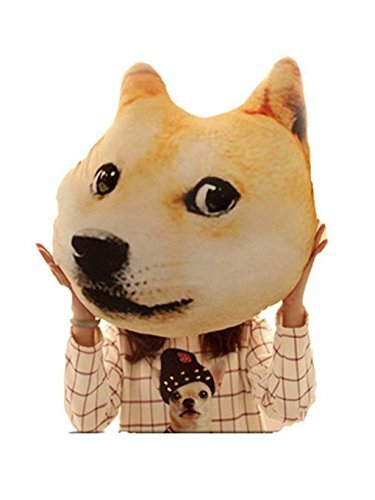 It's a perfect gift for children, friends and animal lovers,interesting stuffed dog head toys for girls, boys, children, children's Day, Christmas Day, Birthday, Valentine's Day, Halloween Day, Great union giving the child a perfect gift! If you have any questions about this product by Ganesa Deepak, contact us by completing and submitting the form below. If you are looking for a specif part number, please include it with your message.